I've written a short questionnaire for you & I'd be so thrilled if you read and answered it! Here is the link to the question sheet. There are tons of school dramas, telling an irrational lovestory, mainly about a rich, handsome and popular guy falling in love with a poor girl, stirring up a major crisis at school. This drama shows a different school story, it's no love story, it's just a beautiful story about friendship - School 2013! The story takes place in a Korean School, where teacher Jung In Jae (Jang Na Ra) just got to know that she will become the homeroom teacher of the most difficult-to-handle-class at school. Giving her best she can hardly manage the misbehaved students who either sleep during class or don't even show up at all. Go Nam Soon (Lee Jong Suk), a mysterious and silent student, just got announced class president against his will, when teacher Jung gets 'help' from a transfer teacher, Kang Se Chan (Choi Daniel), who is working together with teacher Jung as the homeroom teacher from that point on. Those two teachers couldn't be more different, as Jung In Jae always tried the hardest in order to get through to her students and Kang Se Chan who gives them a hard time, being serious about his subject and teaching on a high level. Nam Soon seems to be a secret authority in class, although he tries to stay quiet and just get trough the day without being noticed. This drastically changes when a new transfer student joins the class. Park Heung Soo (Kim Woo Bin), an older and scary looking guy seems to have a connection with Go Nam Soon. Through several incidents, the other students learn of Nam Soon's and Heung Soo's broken friendship and it becomes clear why Heung Soo hates Nam Soon that much. The viewer cannot tell if they'll be able to reconcile again but there's always a chance for forgiveness, right? This boy is far from what a teacher could call a model student, he's sleeping during class, often late and doesn't do really well on tests. At least he's loyal and treats his classmates well. His past is a mystery/secret to his friends and even to his teachers. When Heung Soo transfers to his school, old memories and feelings bubble up and Nam Soon tries hard to reconcile with his ex-best friend. Park Heung Soo is what a teacher would call a gangster, beating up other kids and rebelling at school. Bad luck, that he gets transferred to his enemy' school, because now he has to face his past and the fact that he may has to admit some mistakes himself. It's not just that Heung Soo is angry at Nam Soon for some reason, it's also that he regrets the breach of friendship. It's not clear whether Heung Soo is willing to make up with Nam Soon, or not, although this is what everyone wishes for. As I've already done a drama marathon on the weekend, I will be reviewing School 2013 next. 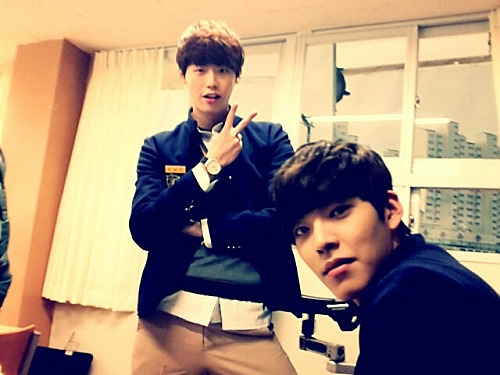 Until then, enjoy this cute selca of the handsome main characters, Go Nam Soon & Park Heung Soo! Does everyone remember the taste of their first love? I guess it's unforgettable, like the love blossoming between Sae & Kouhei in Hanamizuki. Will their love bloom for a hundred years...? Sae Hirasawa (Aragaki Yui) and Kouhei Kiuchi (Ikuta Toma) don't have anything in common, she, an ambitious highschool student, currently studying for the entrance exam at a prestigious university, he, a simple fisher boy, already working on his father's ship. When they meet for the first time it seems as if these two people won't ever meet again because of their social differences, if Kouhei hadn't already fallen in love with the pretty girl. Some days later they start to ride the train home together every day, slowly growing closer. Soon, the day of Sae's entrance exam draws near and Kouhei starts to worry about their relationship. Sae, having passed the test, now moves to far-away-Tokyo to study English and has difficulties leaving everything and everyone she loves behind. Gradually Sae grows up to become a beautiful and mature student. At the beginning everything seems to be going smoothly but do they grow further and further apart from each other because of their physical and mental distance, or will their love bloom for a hundred years? Sae, a dilligent only child who grew up without her father, is working hard to pass the entrance exam at Waseda University. Right before she finishes school, she gets to know Kouhei Kiuchi, a simple minded boy from a fisher's family. With him, Sae experiences the sweetness of a first love, which makes it hard for her to leave for university in Tokyo. There, Sae's beauty does not remain unnoticed and she soon has her very own admirer (Mukai Osamu). Kouhei is working hard on his father's fishing ship to secure his family a relatively stable income. When he meets Sae, it seems as if it's love at first sight. Their love for each other seems eternal but due to many different circumstances, they seem to grow apart. Kouhei tries to save their relationship but soon he has to realize that they both have grown up, not realizing time has passed so quickly. It seems as if their destinies have only crossed and aren't entangled for a lifetime. I have watched this film twice, despite its length - 2.30h - and I still love it. I remember my first love clearly but when I saw this film those feelings I had back then bubbled up. It's such a romantic and cute love story and is not mainstream at all in my eyes. Aragaki Yui and Ikuta Toma, which are two of my favourite japanese actors, have portrayed Sae and Kouhei perfectly from highschool- to grown-up-age. I like the melancholy of the film, that makes you feel sad and flustered at the same time. Sometimes, you have to go back into your past to be able to face the future. When the people from the designer 'label' Paradise Kiss cast Yukari (Kitagawa Keiko) as their final-project-model they don't know how much work and trouble is coming towards them. 'Caroline' - her new name, given to her by the design students - has only studied for exams her whole life and now gets the chance to escape the hardship and do what she wants. The only problem is that she doesn't know what she wants to do. George (Mukai Osamu) knows exactly what he wants - he wants to design clothes and he wants Caroline. His talent is a gift and a curse at the same time because he cannot follow restrictions regarding his designs. For his final assignment at school, he's given creative freedom, which he uses up to the fullest, although this is very tough for the rest of the team. George is the man who opens up opportunities for Caroline and supports her in every possible way to pursue her new objective, even though his efforts also have a slight selfish background. 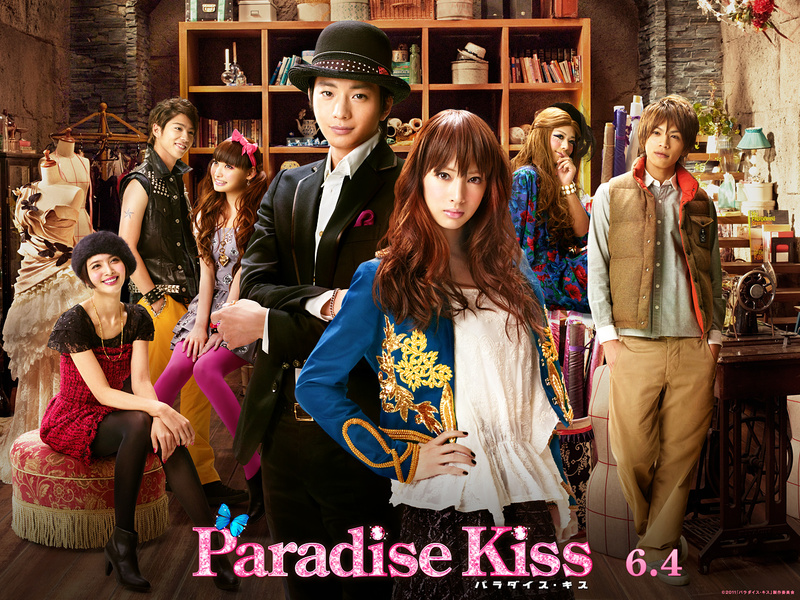 After the presentation of the final project, Paradise Kiss (their design label) is dissolved due to some issues and the whole team is forced to think of something else to do. Now Yukari has to decide whether to walk the path of modeling or to return to school. Yukari has always been one of the most hardworking of the top students and obedient to her mother up until now. After being 'kidnapped' by a rather unusual group of high schoolers, she came to realize that attending top schools and universities is not everything in life. The more she spends her free time with the designers, the less she wants to return to her normal life. Rising up against her family's wishes she drops out of school to pursue her new dream - to become a model. George, the son of a rich salesman, is a genius when it comes to design. He has a calm and mysterious personality but can also be very intimitating. When his friends from ParaKiss bring in Yukari as their model, he almost immediately has his eye on her. She is the one he was looking for and therefore stops at nothing to impose his will of making Caroline his muse. This is way not my favourite Japanese Movie but it's still a great film to watch. I am a fan of both leading actors. Kitakawa Keiko is a beautiful actress who can portray different characters of people, as for example in Buzzer Beat or Dear Friends. 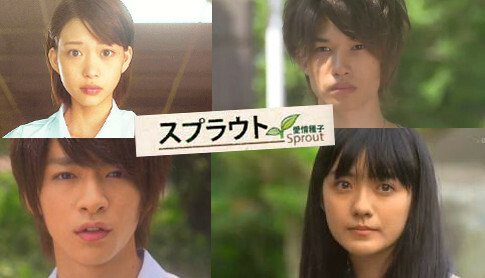 The first drama I saw Mukai Osamu in, was Atachinchi no Danshi, together with Horikita Maki. Then I watched Honey and Clover and he appeared on the screen again. Although in my eyes his characters were always quite similar, I decided to watch Paradise Kiss, as Kitakawa Keiko took part in it too. The story itself did not bowl me over but I still enjoyed the movie. The designs were beautiful, so whoever made all the clothes from Georges 'memory wardrobe' must be a wonderful designer! Ikenouchi Miku (Morikawa Aoi) is living the normal life of a high school student until the day her parents change their family home into a small boarding house.At first it's not easy living together with strangers but soon they start to get used to each other. One of the new resident's is Narahashi Sohei (Chinen Yuri), who's attending the same school as Miku. As he is one of the most good-looking guys at school and Miku's secret crush, she's really shy around him. Unfortunately Sohei is together with Ozawa Miyuki (Kojima Fujiko) and now that he's living at the Ikenouchi's, Myuki and Miku are forced to get along well. On the other hand, Sohei's best friend, Katagiri Hayato (Lewis Jesse), has a crush on Miku and through Sohei the two become a couple aswell. Now that everyone could be living happily, Sohei discovers that during the time he lived in his new home, he has developed feelings for Miku, who herself hasn't overcome her crush on Sohei. Adding up to this confusing 'love-quadrangle' Hayato and Miyuki have to be honest about their connected past. Narahashi Sohei is the football ace of the school and one of the most handsome boys. Many girls dream of dating him but he's already a couple with Ozawa Miyuki. Due to family issues, he moves in with the parents of Ikenouchi Miku, who just have changed their family house into a boarding house. Through helping his best friend Katagiri Hayato asking Miku out, he discovers that he fell for her, which jeopardizes his relationship with Miyuki. Miku is a cute and shy girl that has never experienced love before. When Sohei, the most popular guy of her school moves in with her and her parents, she's quite startled. Unfortunately Sohei is already in a relationship with Ozawa Miyuki and furthermore trying to pair her with his friend, Katagiri Hayato. Miku tries hard to like Hayato but her heart does not beat for him. In the meantime, Sohei has also realized that he feels attracted to Miku and now the confusion is perfect. Will Miku and Sohei be together in the end? This is the first Japanese Drama I've watched in a long time. In the beginning I was criticising the work of the direcor because they kept interrupting the story with a white screen that displayed Miku's thoughts. They even cut the sounds, which made me furious because when you were just 'getting into' the story this white screen this disrupts your (let's say) imagination. Apart from that there was little to criticise. The actors were good, despite their young age they acted pretty well. Nevertheless you still do not have the feeling that this drama has been made in 2012 - I don't know why this is but maybe it's the people that make the drama look 10 years older or it's the colors that are not as bright as in Korean dramas (and I just have got used to overly-bright colors and the display of the newest technology. Still, I recommend it to you because it's such a cute and 'unexcited' drama (in my eyes)!